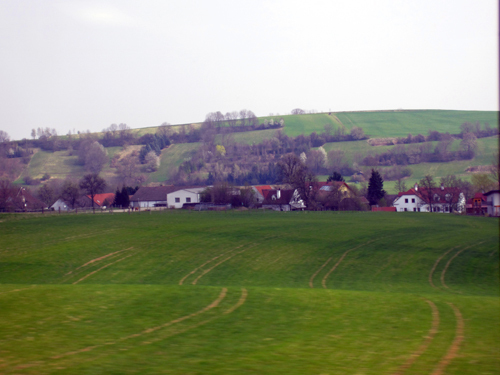 After four days of sunshine and warm weather in Vienna, we set out by train across Austria for Salzburg, admiring the countryside which was lovely despite the weather rapidly turning gray and dreary. 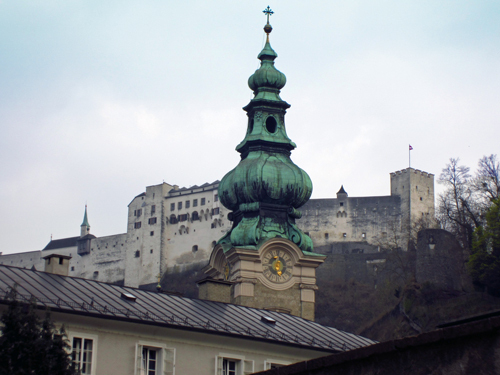 Vienna has a population of about 1.7 million people, so after 3 days touring and battling our way through the Easter week vacation crowds, I was really looking forward to much smaller Salzburg, about a tenth the size of Vienna, even if it was only for a couple of days. 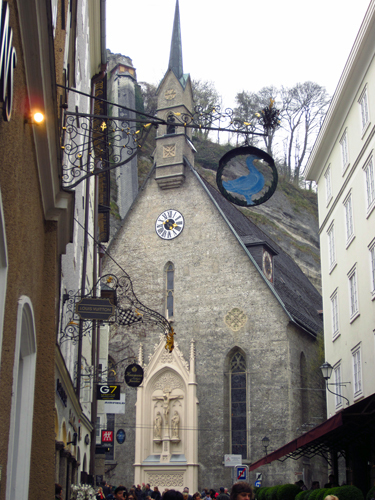 Our hotel was the Weisse Taube, right in the largely pedestrian only center of Salzburg’s old town (altstadt). I tend to pick hotels based on a combination of location and price, and I appreciate having breakfast included (just simpler), so this one was perfect. Nothing fancy, small but comfortable room, shower that works fine (always a plus in Europe) and a lovely Austrian breakfast, just around the corner from the main square of the town (above). 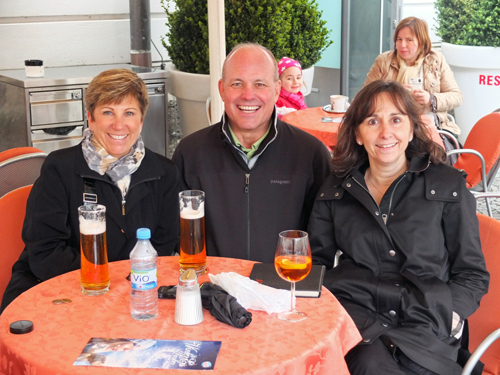 After dumping our bags at the hotel, we grabbed a quick bowl of goulash soup to warm up at a cafe right on the square, and then set off with our Salzburg card to see the sights on our list. 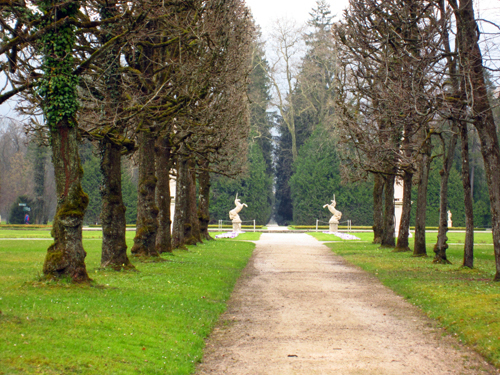 First up, Schloss Hellbrunn, a short bus ride outside of the center of town (bus rides are free with the Salzburg card). 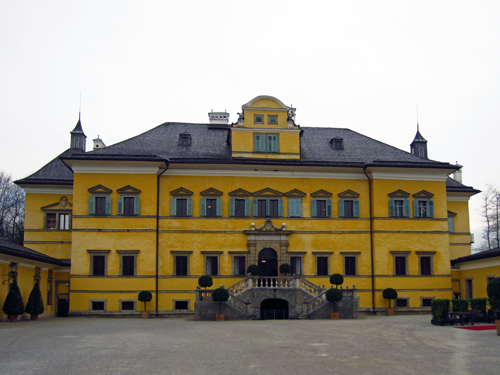 Built by Markus Sittikus von Hohenems in the 1600s, it was designed as a summer day residence only and thus has no bedrooms in the main palace. 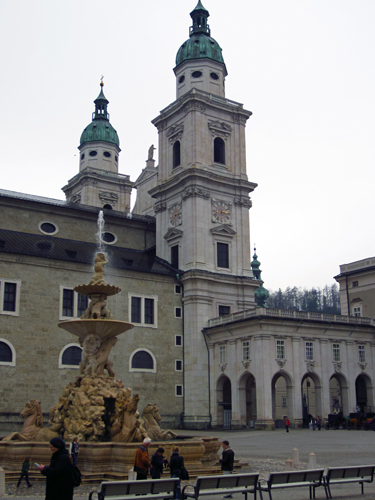 The main attractions today are the trick fountains, fed by underground springs, that the Prince-Archbishop of Salzburg used as practical jokes on his guests. I’m guessing there was a fair amount of alcohol involved, and had I had a few drinks I might have found it more entertaining, but once inside the gates you are locked into a corny tour with tricks being played on you, and we just weren’t in the mood in the cool, drizzly weather. 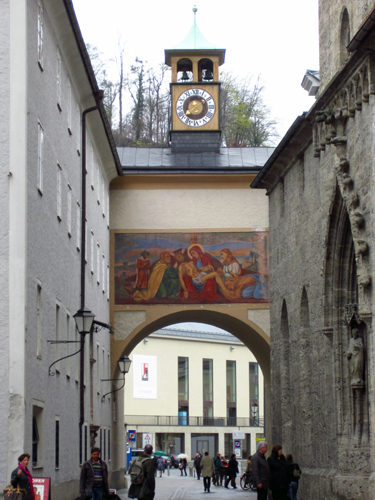 But if you travel to Salzburg with kids this would be tons of fun for them. 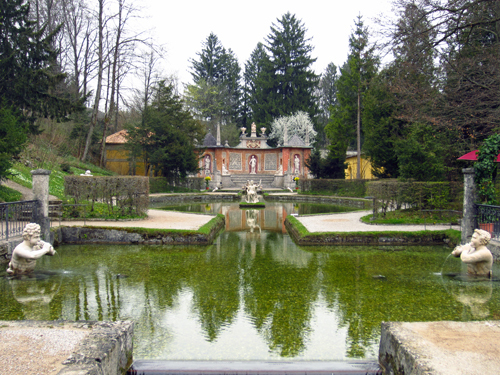 The park-like gardens surrounding the palace are lovely, and I’m guessing on a warm and sunny day would be great for a nice long walk. We chose instead to hop back on the bus into town, but not understanding the bus routes, ended up across the river from old town, giving us an excuse to walk along the river as we made our way back to old town and our hotel. 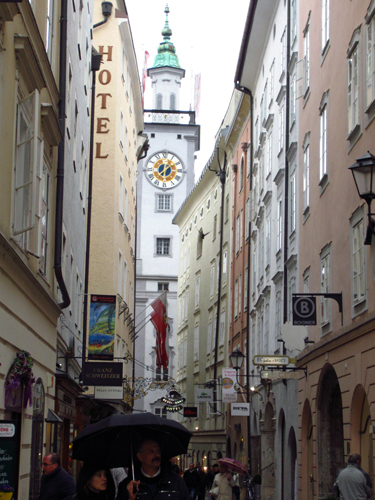 The buildings in Salzburg are quite lovely, even in the rain. 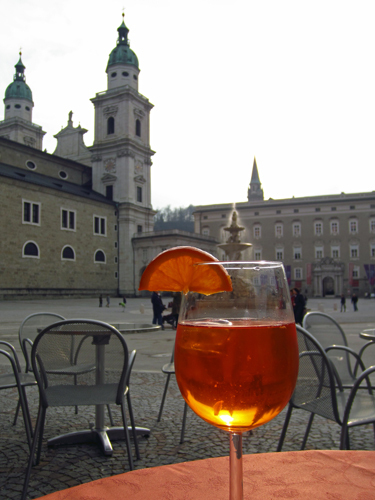 By the time we arrived back in the main square, the weather had lifted just enough to entice us to enjoy a late afternoon aperitif in the square, admiring the view. 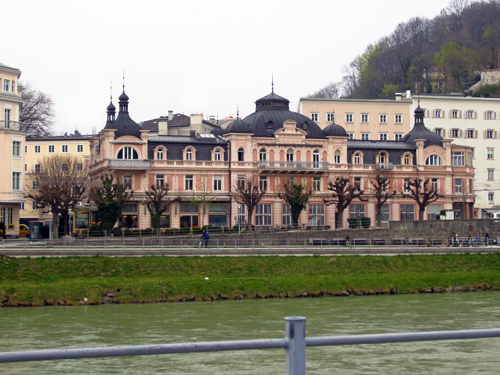 This cafe is actually part of the museum complex that’s right on the square, and we took advantage of our Salzburg card for their special exhibit about the real Von Trapp family who hailed from this area. (Side note confession: my husband thought I was an idiot because I thought the Sound of Music story was actually true. 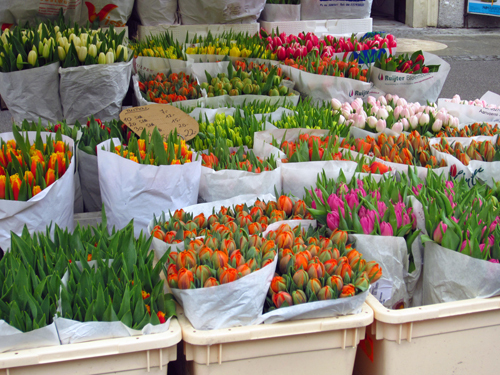 It wasn’t – although the Von Trapp’s did make their way out of Europe during the war and settled in Vermont – but that was by boat, not walking across the Alps.) 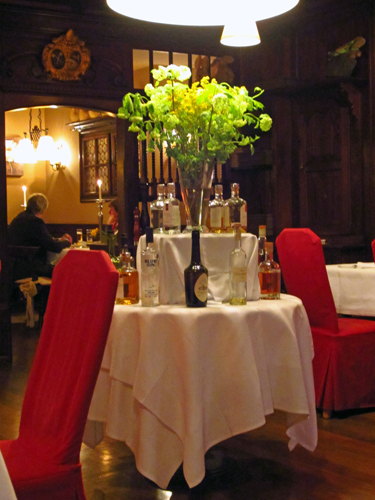 For dinner, I had reserved a table at the ancient St. Peter Stiftskeller, a UNESCO world heritage site and restaurant dating back to 803. 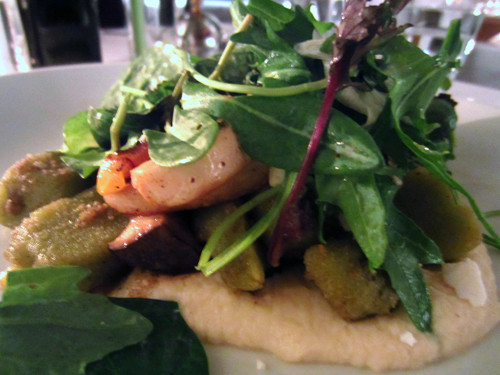 If you are so inclined, you can enjoy dinner in one of the upstairs ballrooms accompanied by a Mozart concert and feel transported, but we chose a quiet dinner alone on the first floor instead. 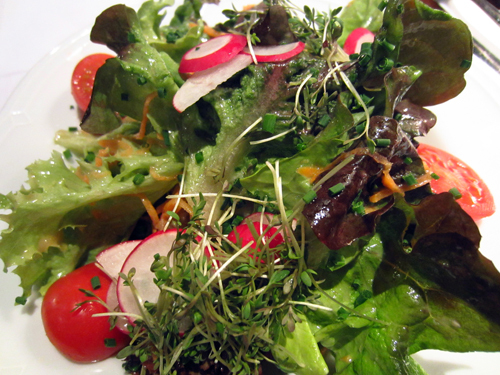 The menu is a bit more upscale, and prices are too, but the white tablecloths and attentive service make this a nice spot for dinner. 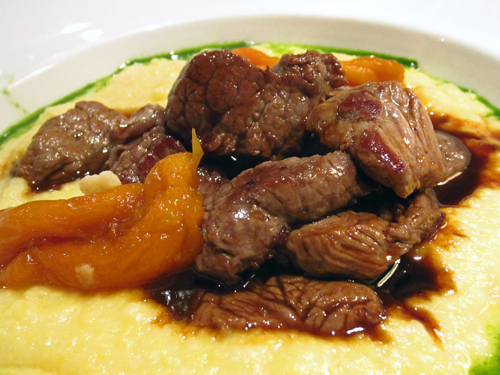 I thoroughly enjoyed the lovely green salad and my beef tips on creamy polenta with roasted yellow peppers. 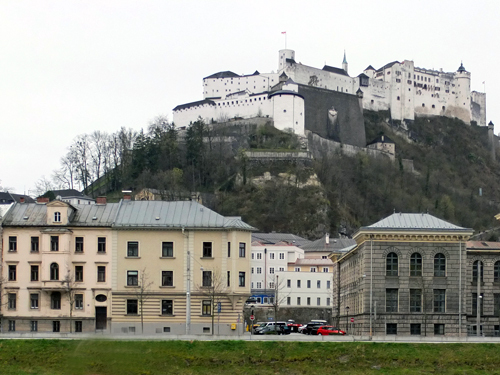 On our second, and really only full day, in Salzburg we set off for the Hohensalzburg Castle, the huge fortress that towers over the small town of Salzburg. Construction began on the fortress in 1077, and it’s one of the largest medieval castles in all of Europe. You can walk up if your knees are better than mine, but we took the short funicular ride up to stay warm. Even though it was blustery and cold up on the hill, the views from the fortress made it totally worth the trip up. 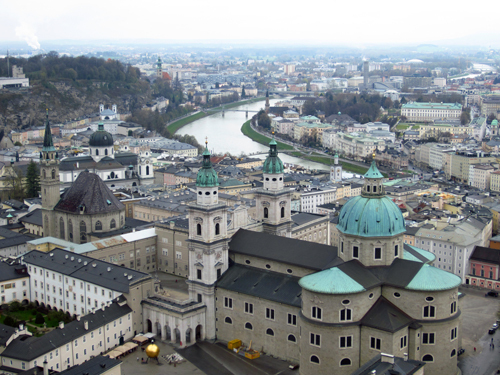 Salzburg’s pretty domes are a perfect backdrop against the River Salzach. 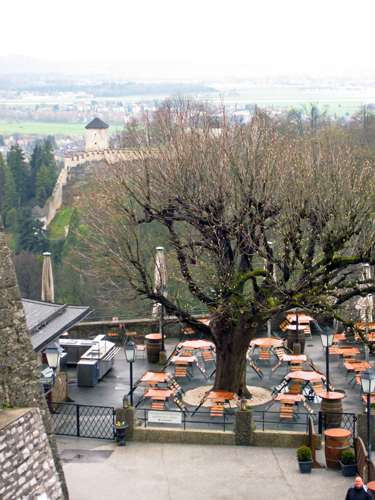 I imagine in good weather these little cafes at the fortress would be a wonderful spot for a coffee, lunch or aperitif. Down from the fortress, we meandered through the tiny old town streets before tucking ourselves into the very small S’Nockerl Mediterranean restaurant for lunch. 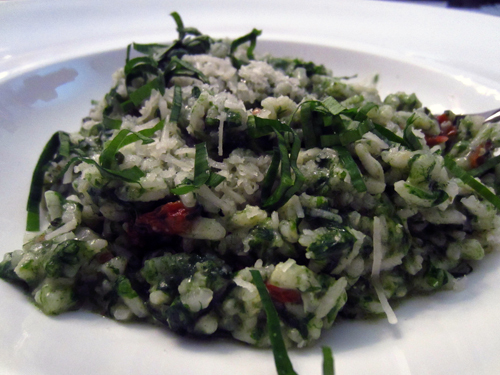 We were a little schnitzel-ed out by this point in our Austrian adventure, so a nice basil risotto for me and saltimbocca for my husband seemed like a nice break. 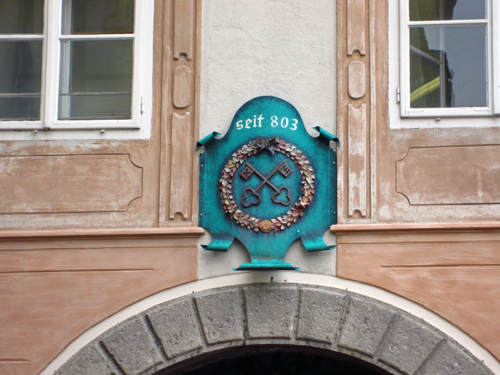 Had I done a bit more research ahead of time I would have known this restaurant is named for the classic snockerl sweet dumplings – souffles really – that are a specialty of Salzburg. I was just happy to be inside somewhere warm, enjoying a relaxing lunch break. 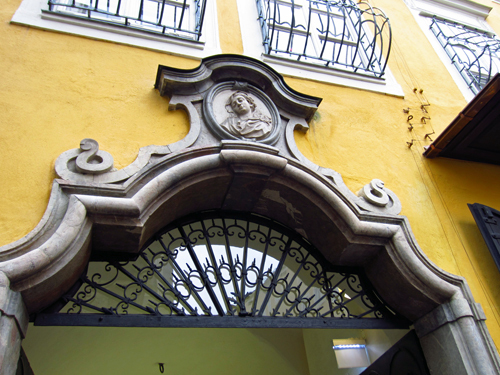 After lunch, we wandered down the busy shopping street of Getriedegasse to find Mozart’s birthplace and museum. There isn’t really much to photograph here, as it’s just the few tiny rooms where his family lived. 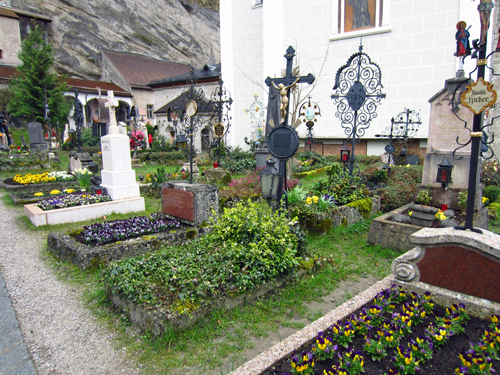 But it’s well worth a visit to read all of the little placards with the family photos and to understand the history behind Salzburg’s most famous composer. 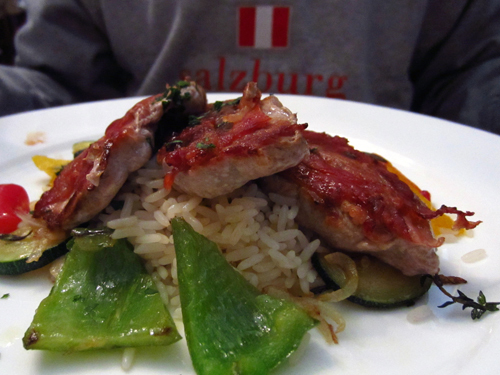 For dinner on our final night, we headed to Blaue Gans – it’s also on Getriedegasse, and isn’t marked very well, unless you look up and see the blue goose sign hanging high up on the building. 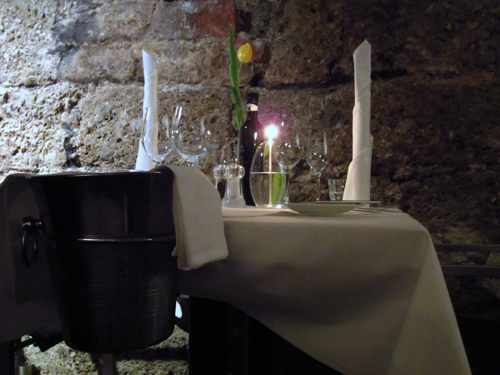 We chose the non-smoking room (a relief after all of the smoking in Vienna), and were thrilled to find that the no smoking dining room is actually located in this gorgeous cellar dating back to the 1300s. 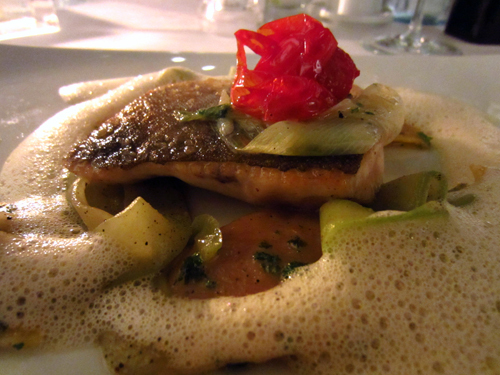 The food here was really top notch – the hearty gnocchi salad that we both shared and still couldn’t finish… …followed by a local fish dish with truffle foam were both inventive and delicious. We enjoyed a local Austrian red wine, blaufrankisch, that I can now add to me repertoire of favorites from Austria (gruner veltliner is my top white). 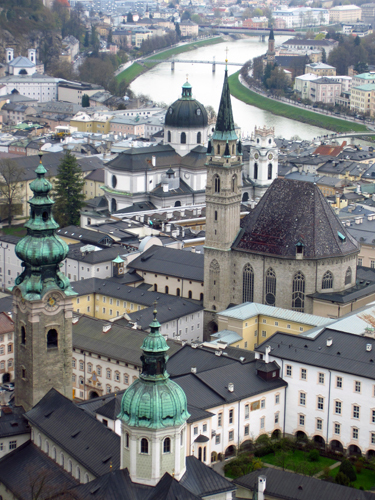 Salzburg was seductive and charming. Had I had more time and better weather, I would have surely enjoyed some hiking in the pretty hills and done some damage shopping in the old town. But we were here to meet up with our college friends and we set out on Saturday morning early to make our way to Prague. Wait until you hear what happened on the drive!